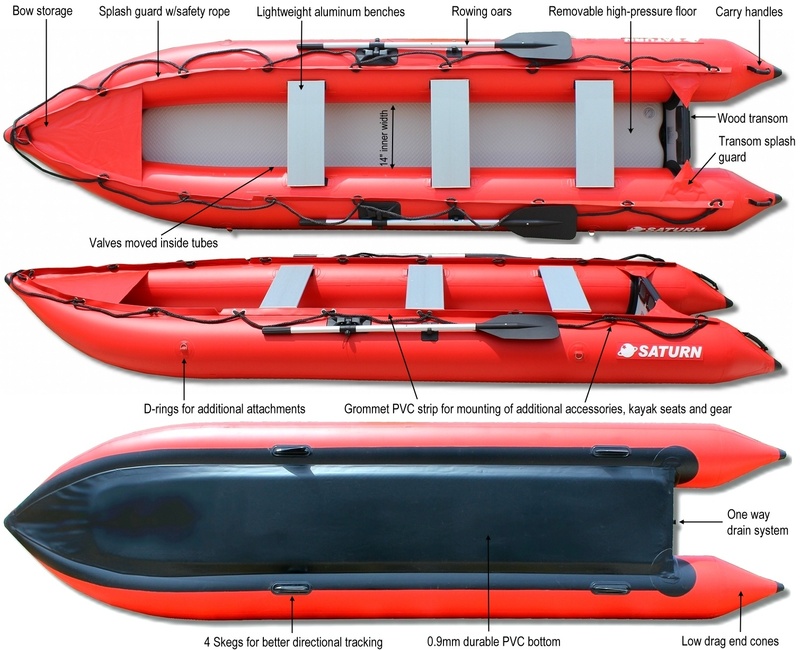 14' inflatable Kayak & inflatable Boat crossover - KaBoat SK430. New V2.0 with splash guards on top of tubes is now in stock. This new and revolutionary product, is a crossover between an inflatable kayak and an inflatable boat – KaBoat! It can be used as a regular kayak, just paddling anywhere you want, ocean, bay, river or lake. 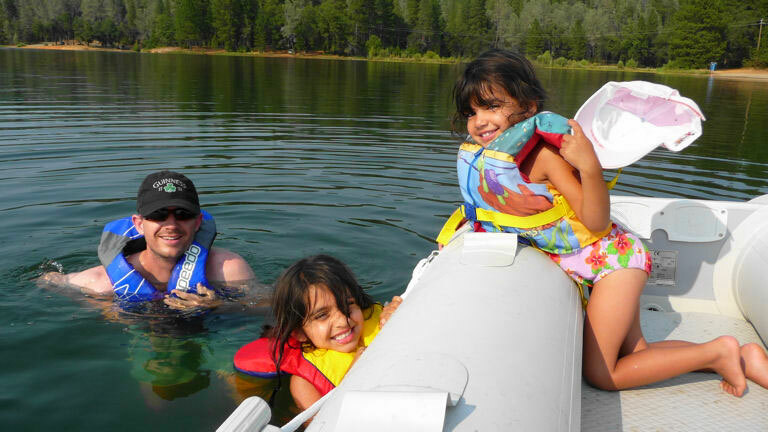 If you get tired, use an electric or gas engine installed on marine grade plywood transom. See customer's video of 14' SK430 KaBoat with Torqeedo Travel electric motor. 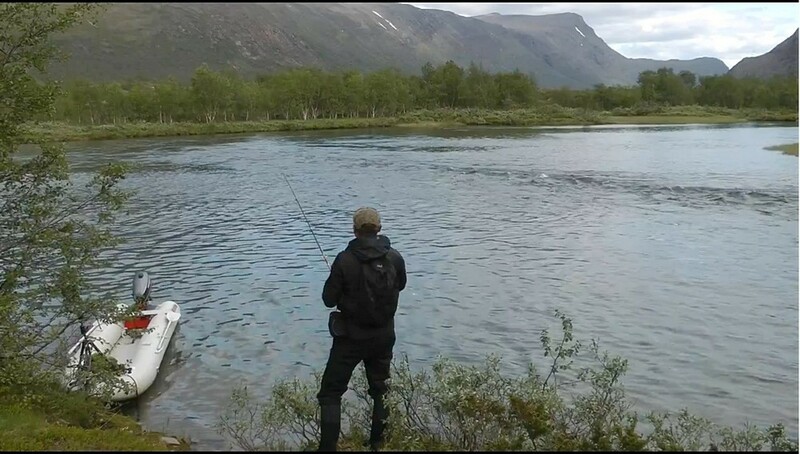 The KaBoat's exceptionally stable design allows you to stand, fly fish or even get into those narrow spots where other boats can't go to get the best fishing. The KaBoat is excellent as a dinghy for a yacht or sailboat. It can also be used in light	whitewater action. 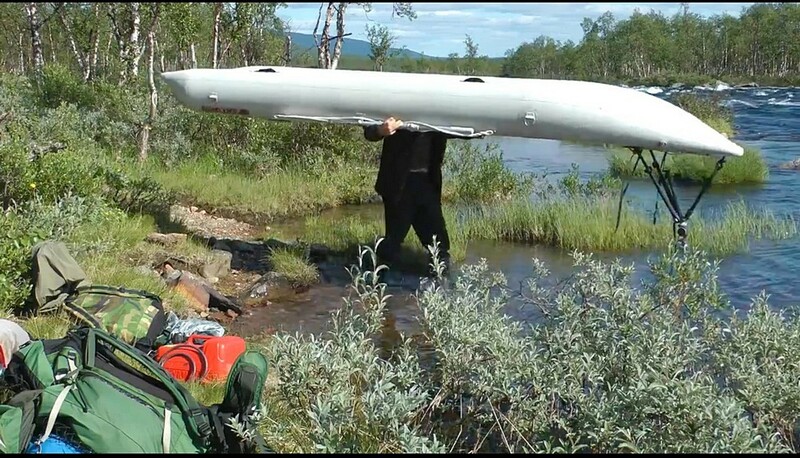 See KaBoat expedition in Swedish Lapland whitewater rivers. 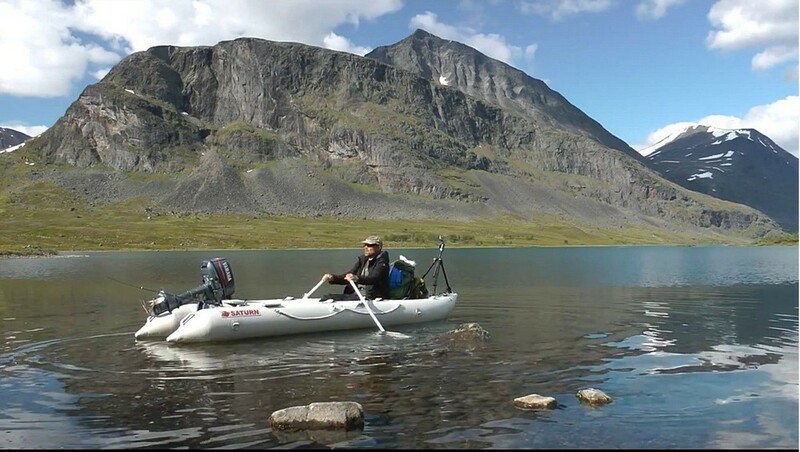 Kayaks can be only paddled, but the KaBoat allows you to use a small gas or electric engine to cover larger distances. 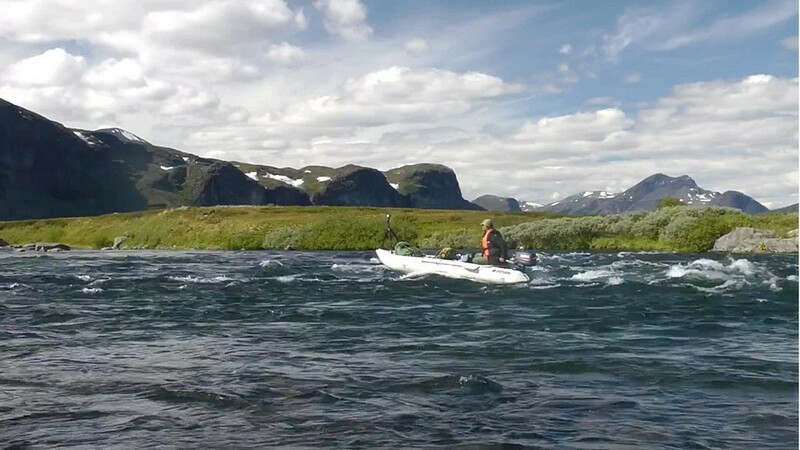 If you get tired of paddling, you can start using an optional outboard	engine. Included: hand pump, repair kit and rowing oars. Carry bag and benches are optional, not included. Click here for more inflatable KaBoat video clips. Kaboat is a wonderful bit of kit apart from the inflatable floor. However, an old windsurfer makes an excellent replacement. I got my SK430 early spring of 2017. I have taken it down several local rivers on many fishing trips in 2017 and the boat has performed above expectation. Handles well, very stable and no durability issues. Got one of those Saturn kaboats from your website, the fourteen footer. It’s a lot of fun. Easy to move. Easy to inflate. Easy to control when I using it. I use it at least once a week, and it’s totally worth the money. Best seven-hundred bucks I ever spent! I recently purchased a 14 foot Kaboat. I chose this model feeling it would best meet my needs.\r\n\r\nI kitesurf, fish, windsurf, and kayak. I have a small trailer that holds all my gear - putting a hardshell kayak or small boat on the racks (on the trailer or on the car) can be done, but has drawbacks. The boat is exposed to theft and weather, gas mileage suffers, and you can't really store it loaded and ready to go at all times.\r\n\r\nThe Kaboat has worked great. It weighs about the same as my 14 foot hard shell plastic kayak (58 pounds) - so no difference in the weight. It fits inside the trailer (no need for racks on the car and the loss in mileage, danger of theft, etc.). When I do blow it up - if I want to leave it blown up (say, while I am camping) I can put it on top of the trailer and fasten it with straps.\r\n\r\nI paddle the Kaboat - can go about 3 MPH where I can do 4.5 MPH with my hardshell kayak. But - it is so much more versatile. I have a sailing rig that fits on the Kaboat - with a moderate breeze I can travel at 5 to 6 MPH in comfort and no strain. I have a 1.5HP air cooled outboard (weighs 12 pounds) that can take it 5MPH at half throttle - and almost pop it on to a plane at full throttle. All the speeds are verified with a GPS. I recently got a used 3.5HP and that puts it on plane with little effort. Bottom line - the hardshell kayak I can just paddle. With the Kaboat I paddle, sail, motor - whatever the situation calls for. And it all stores easily in my trailer. I leave the trailer loaded and ready to go for the weekend.\r\n\r\nI mentioned that my son and I kiteboard as well. The Kaboat is our RV to kiting spots. We can load 4 kiteboards, 4 kites, and our gear. Motor to any location, even setup in the water (the Kaboat is stable enough to pump up the kite while standing in the boat). Kite and return to our Kaboat to rest, get water - using it as base. This works out great in a place like the Florida Keys where you really need a boat to catch all the wind directions. The Kaboat has shown its veratility and is number one for utility.